Durgadevi Charitable Trust was established in Pune in the year 2002 as a Public Charitable Trust (Regn No. E-3593 dt 09/07/2002) The Trust was established as a result of a dream cherished for many years by Mr Sajjan Kumar Agarwal, an NRI based in the USA. 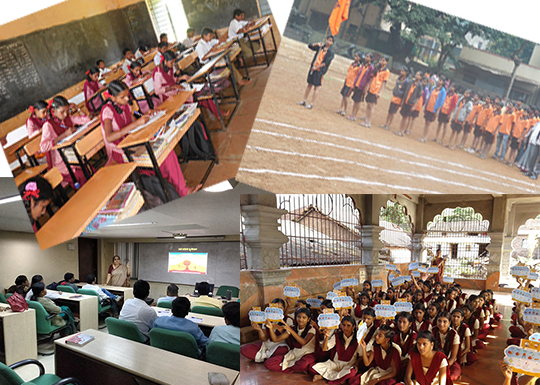 In a short span of time, the Trust has come a long way in taking up specific activities in the field of education. Currently the Trust is active in Maharashtra and parts of Rajasthan. Provide income generating opportunities through Vocational training for Women. Individual assistance for students who are economically or physically challenged. Capital and revenue expenditure for capacity building. We work only in the area of education. The project should normally have been in existence for 3 to 5 years. We evaluate people behind the project; references are important. Where Government grants are available, our assistance would be marginal. We like to get involved in supervising and monitoring through regular feedback on the project. We normally do not provide for capital expenditure. Our assistance, to start with, is on year to year basis. However, we are looking for long term association. We expect participation of community where we work. We work towards the empowerment of women through our different initiatives. We work towards the empowerment of children through our different initiatives. We provide the assistance for education through our different initiatives.